Shaukat Khanum Hospital cares for thousands of patients who rely on your Zakat. Last year we were able to provide free cancer treatment to 75% of our patients through Zakat funds. We covered all diagnostic and therapeutic hospital fees, which would have racked up bills that Pakistan’s poor couldn’t dream of settling. 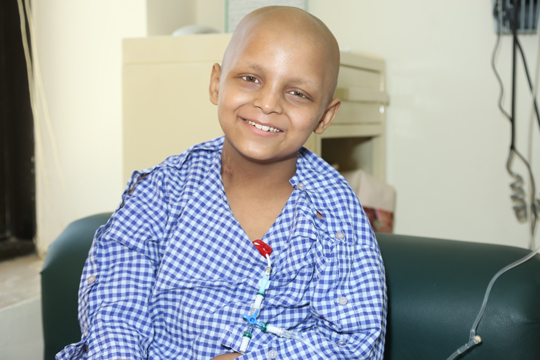 Ali Ahmad is one of the many children who is growing up battling cancer at Shaukat Khanum Hospital. With the will of Allah, his life has been saved through your Zakat, the efforts of hospital staff and the prayers and sacrifice of his family. It was only through the Zakat of Muslim donors worldwide, that Imran Khan was able to realise his dream of free cancer care for Pakistan’s poorest, two decades ago. It’s only with your Zakat that we are able to continue this work every year. Without it, we’d be forced to turn away thousands patients who have no chance of recovery in a country with no free national health service. Every year, our patients at SKMCH Lahore and Peshawar depend on your ongoing support. Will you donate your Zakat towards the full or partial treatment of a patient like Ali? Cancer treatment is costly. This table provides some idea of the approximate cost of treatment for different types of cancer. Without your Zakat, poor patients in Pakistan simply couldn’t afford cancer care. We know the importance of giving Zakat and care about transparency. Find Out More about how we spend it, and use our Zakat Calculator to work out your annual Zakat contribution now. In Pakistan, many cancer patients are too poor to meet their basic daily needs, let alone the high cost of cancer treatment. Find Out More about our Sponsor a Cancer Patient Appeal, and how you can sponsor the treatment of an individual patient.